MIAMI, U.S. — Tierra Nueva, a Miami-based coffee confectionery technology company majority owned by ProspEquity Partners, announces the placement of Dunkin’ Coffee Thins on the shelves of New England’s Market Basket grocery stores. The rich, creamy confectionary treats are made using whole Dunkin’ coffee beans crafted into silky-smooth, edible squares available in two delicious Dunkin’ flavors: Original Blend and Caramel. Market Basket is a chain of 79 supermarkets in New Hampshire, Massachusetts and Maine. The grocery store chain, headquartered in Tewksbury, Mass., celebrated its 100th anniversary in 2017. Market Basket was founded in 1917 by Greek immigrants Athanasios and Efrosini Demoulas as Demoulas Market. Today, Consumer Reports ranks Market Basket as No. 2 among national supermarkets in terms of customer satisfaction, second only to Wegmans. “We are pleased to partner with Tierra Nueva and fellow Massachusetts-based brand Dunkin’ to place Dunkin’ Coffee Thins™ on our shelves to add variety to our customer offerings and provide another stream of top-line revenue for our stores,” said Joe Garon, Buyer with Market Basket. 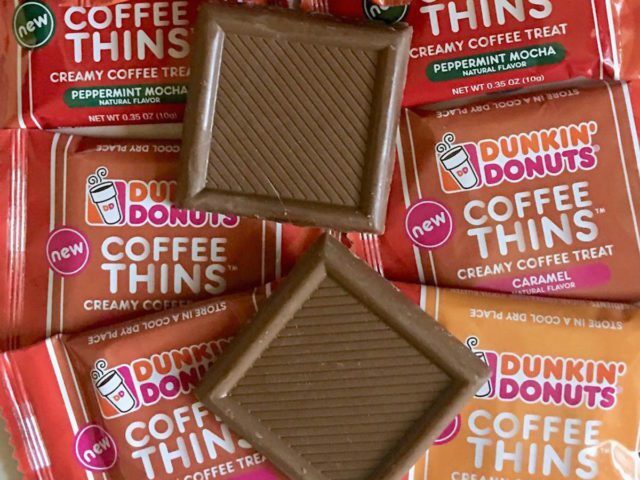 Tierra Nueva recently announced expansion of Dunkin’ Coffee Thins™ onto shelves in CVS drug store locations and other national grocery stores and retailers.